Reaching the right insurance prospects, at the right time should be easier than ever before. However, this is not necessarily the reality. Despite increased data resources and analytic capabilities, insurance marketers continue to struggle to sort the wheat from the chaff when it comes to lead quality. This was just one of the findings in a recent Aite Group industry report titled ‘Lead Generation in Insurance: In Search of the Golden Leads,’ authored by Senior Analyst Samantha Chow. 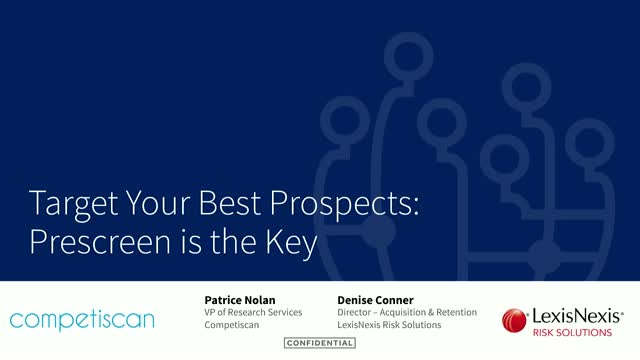 During this webinar Chow will uncover the findings of her report with LexisNexis Risk Solutions and discuss some of the innovative solutions available today for insurance carriers. Prescreen credit can help insurance marketers maximize the effectiveness of their acquisition campaigns by identifying the best prospects for your business based on their risk profile. Join us for this informative webinar as Senior Acquisition & Retention Consultant, Rick Schlegelmilch explores the unique opportunities presented by prescreen credit. Rick will also provide the latest updates on new and highly predictive scores and attributes available from LexisNexis Risk Solutions. You know the old saying - marketing wants to write every prospect: meanwhile underwriting wants to reject every prospect. Insurance marketers exist in a challenging and dynamic environment - seeking to strike the elusive balance between sales quotas and underwriting expectation. •Key findings of our recent LexisNexis study of insurance marketers, underwriters and product managers from top personal lines carriers. •Unique insight into the opportunities that exist for greater collaboration throughout the policy life cycle. The Customer Journey Has Changed: Are You Ready?